A “Japanese horseradish”, “a turnip”, the “eggplant”, the “flower of an eggplant”, the “lotus root”, and the “leaf of the lotus root” are drawn. Though simple, the characteristic portion is drawn minute and is a picture with presence.Also by the door age, of course, food is a demand element and the book of cooking was also published. 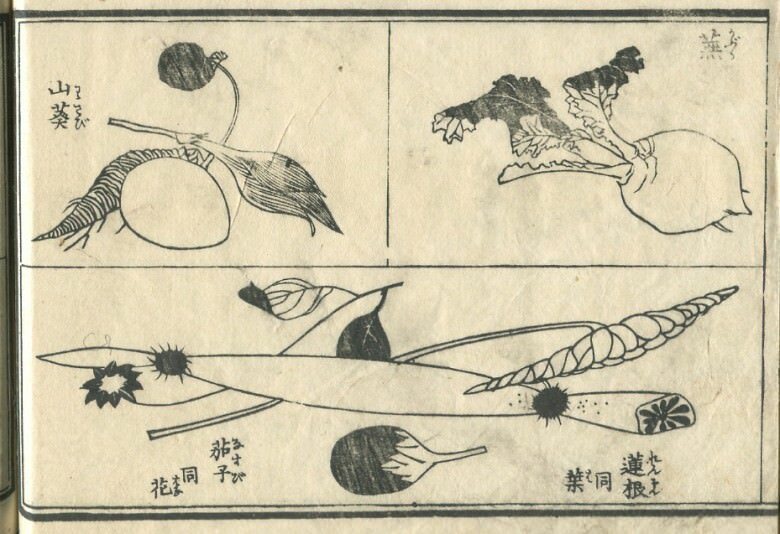 It seems that vegetables might also become a subject matter of the picture, and it can also be called the favor that the vegetables of the Edo period can be seen in this way. Because what does not lean concern is not drawn.